Yesterday was the long-awaited launch of the new iPhone 3GS and just a few days ago Apple released the iPhone OS 3.0 update into the wild for older devices. As expected, there are some really nifty gifties! A while back MacYourself published a compilation called “28 tips & tricks all iPhone and iPod touch users should know,” which focused on some of the new features iPhone OS 2.0 brought to the table. Almost a year later the 3.0 update is here and there’s a ton more to learn! New discoveries will probably continue to pop up in the coming days and weeks, but with a whole day of using the iPhone 3GS under my belt I have already come across a bunch of cool improvements aside from the ones Apple has been hyping. Note that these also apply to the iPod touch, original iPhone, and iPhone 3G running the 3.0 software. Finally! This has been one of my most requested features since the beginning, so I’m glad Apple has stepped up. 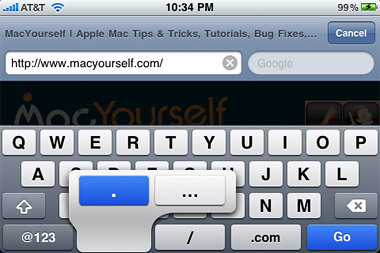 Pressing and holding a link in 2.0’s Safari used to just show its URL in a popup bubble. The new and improved Safari in 3.0, however, offers a few choices: Open, Open in New Page, and Copy. This is essentially the same as opening links in a new tab on the desktop version of Safari – a great step forward in the iPhone & iPod touch browsing experience. The little battery icon is okay for judging approximately how much battery life remains on the device, but it’s tough to get an accurate reading. To remedy this insufficiency, Apple has added a new option in the latest iPhone operating system. Under Settings > General > Usage, there will be a Battery Percentage field. Switch this to On and a numerical value will display on the top status bar next to the battery icon. Note this is a feature exclusive to the iPhone 3GS. It used to be a pain to go back and delete text that you typed if your mind was changed midway through. Or perhaps an error was made and the text wasn’t needed anymore. With 3.0, all it takes is a simple shake of the iPhone or iPod touch to invoke a menu which allows you to undo what you’ve just done. This also works when you paste something that was copied to the clipboard and then decide you want to get rid of it. 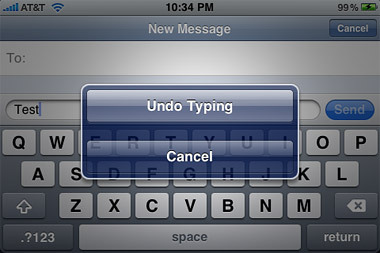 Speaking of typing, the keyboard in iPhone OS 3.0 is slightly more advanced than the one it replaces. For example, pressing and holding down the “.com” button in 2.0 brings up options for “.net” and “.org” as well. The new software’s keyboard takes this a couple steps further by adding a “…” option to the “.” button and a “–” option to the “-” button, among others. The best way to figure out where these hidden keyboard shortcuts exist is simply to start pressing and holding keys to see what happens. Sometimes you don’t want to include the entire body of an original email message that you’re replying to or forwarding. Since 3.0 has support for cut, copy, and paste, there are powerful text selection tools as well. To try this out, view a message in the Mail app and double tap the beginning of a word. That word should be highlighted with drag-able handles on both sides. Expand the selection to cover the text you want to keep and then tap the Reply button at the bottom. Choose to reply or forward and you’ll find that only the content you selected was carried over to the new email. The Messages app received quite a bit of love in iPhone OS 3.0 and now packs some convenient new features. For example, there is an Edit button in the top-right corner of the screen while viewing texts in a conversation. Tapping this button will enable you to select text messages line-by-line, then it gives you the choice of deleting or forwarding them. Unselected messages will remain untouched. As covered in our 28 tips & tricks for iPhone & iPod touch article, the way to force quit an unresponsive app in 2.0 was to hold down the Home button for a few seconds. Since the new iPhone 3GS uses this action to launch Voice Commands, a new method was needed for the 3.0 software update. Force quitting is now done by holding the sleep/wake button until the red slider displays. Holding the Home button down at this time will kill the problematic application. Let’s say you’re viewing home screen #3 right now on your app-filled iPhone or iPod touch. Pressing the Home button from here will bring you directly to the main home screen (#1). If you’re already at home screen #1, though, something else happens when you press the Home button. It slides you over one more spot to the left and launches 3.0’s new Spotlight search function. While viewing media (music, videos, audiobooks, podcasts, etc.) in the iPod application, there has always been a dot which marks where the playhead is currently at and can be dragged to rewind or fast-forward. It worked well enough, even though precision scrubbing was always difficult. Improved in iPhone OS 3.0, the iPod playhead scrubber can be more or less precise based on your input. As you move your finger horizontally to rewind/fast-forward, you can also drag it up and down to change the speed at which it scrubs. The lower you go on the screen, the slower it moves incrementally. The speeds are: Hi-Speed (top), Half Speed, Quarter Speed, and Fine (bottom). Thanks for the informative article. However, I have the original iPhone, and there is no Battery Percentage field in my Settings, and I have never had the bar in my iPod that lets you scrub through the media. I can only play, pause, and change the volume. Upgrading to 3.0 didn’t add these features either. The iPod bar is something I’ve always wished I had when listening to my many podcasts. I guess it’s just a 3G feature. I’m planning on upgrading to the 3G S soon, so I’m looking forward to having these missing features, plus a whole lot more. Thanks for bringing the battery percentage thing to my attention. It turns out this is indeed a feature that’s not available on all models. 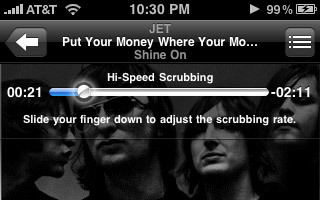 However, the iPod scrubber does work on all of them. It does not display automatically — while you are listening to a song try tapping once on the large album art. The playhead should come up as an overlay, which will enable you to scrub. The battery indicator works on my 3G S and I’m loving it, but not my iPod touch 2G. My guess is it requires hardware support. I also didn’t know about #5, but I’ve been using a similar feature since beta 1. When you select editable text for copy and paste, you can press delete or just start typing something new. This is useful for deleting large chunks of texts and I’ve found myself deleting selected text more than cutting or copying it. Hey. Before in any app if you could double click on the home button and the littlie music menu would come up, but now it doesn’t seem to work I used to enjoy listening to music while playing games but I can’t any more is there any way of doing this? You can re-enable that functionality by going to Settings > General > Home, and then choosing iPod in the menu.